Astronomer Dr. Jill Tarteris Director of the Institute?s Center for SETI Research and also holder of theBernard M. Oliver Chair for SETI. She is one of the few researchers to havedevoted her career to hunting for signs of sentient beings elsewhere, and thereare few aspects of this field that have not been affected by her work. 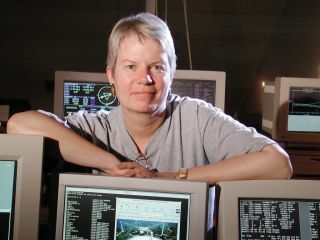 Dr. Tarter was the lead forProjectPhoenix, a decade-long SETI scrutiny of about 750 nearby star systems,using telescopes in Australia, West Virginia and Puerto Rico. While no clearlyextraterrestrial signal was found, this was the most comprehensive targetedsearch for artificially generated cosmic signals ever undertaken. Now Jillheads up the Institute?s efforts to build and operate the Allen Telescope Array, amassive new instrument that will eventually comprise 350 antennas, each 6meters in diameter. This telescope will be able to enormously increase thespeed, and the spectral search range, of the Institute?s hunt for signals. Jillrecently provided an ATAupdate for SPACE.com readers, in which she wrote: "One of thegood things about the ATA is that there are likely to be may stars that arevisible at any one time within its large field of view, so with multiple beamformers, and multiple detectors, we can explore multiple stars simultaneously,at different frequencies if we want. Furthermore, we can do this while ourastronomy colleagues are mapping the sky for hydrogen gas, or large biogenicmolecules, or other phenomena of scientific interest to them. This multiplexingpotential is a new and exciting innovation that will speed up the SETIsearching in the next decades." Indeed, being as much of anicon of SETI as Jill is, perhaps it is not surprising that the Jodie Fostercharacter in the movie ?Contact? is largely basedon this real-life researcher. Be a part of history! JoinJill Tarter as the AllenTelescope Array begins operations. The ATA-42 - the first 42 elements ofthe full antenna array - will do in five minutes what used to take 10 days.When the ATA-350 is complete, it will survey tens of thousands of star systemsand eventually, millions! You can participate in anamazing opportunity! Be the guest of Jill and her husband, Jack Welch, a memberof the SETI Institute Board of Trustees, and Watson and Marilyn Alberts Chairfor SETI at UC Berkeley, for a dinner at their Berkeley home. Later that evening, Jilland Jack will fly you and three guests to Hat Creek Radio Observatory, north ofMount Lassen, in their pressurized Cessna 210 airplane. Hat Creek is the homeof the ATA where SETI observations, as well as radio astronomical surveys, areconducted. Upon your arrival, Jill andJack will present a tutorial on how to build a very large telescopeinexpensively from a large number of small dishes. You will also be treated toa preview of the expected scientific return from this innovative newinstrument. You will dine again with Jill and Jack and enjoy an overnight stayin the Hat Creek House on the observatory site. The next day, you?ll be able tohike and tour the local area before your return flight. This expedition willcreate life-long memories that you will share with friends and family for yearsto come - and you can boast you were among the first to experience the ATA-42and all that it promises.